Cannot be Normal Summoned/Set. 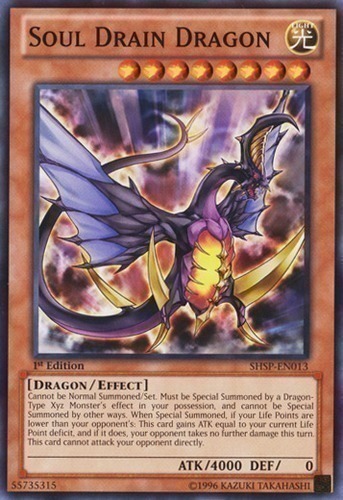 Must be Special Summoned by a Dragon-Type Xyz Monster's effect in your possession, and cannot be Special Summoned by other ways. When Special Summoned, if your Life Points are lower than your opponent's: This card gains ATK equal to your current Life Point deficit, and if it does, your opponent takes no further damage this turn. This card cannot attack your opponent directly.